Some marketing and advertising insiders have recently implied that it’s becoming more common for agencies to be “ghosted” by clients. This would be yet another disturbing trend for agencies to contend with. “Ghosting,” a term originally used to describe the abrupt disappearance of romantic prospects when online dating, has more recently been applied to professional relationships, such as between job seekers and employers, or clients and agencies. Is it becoming more popular for clients to “ghost” their agency? A few weeks ago, The Drum published an article featuring Verizon CMO Diego Scotti, who talked about the dangers of advertisers “becoming lazy” in their relationships with agencies, emphasizing the importance of both parties working together to nurture and grow their relationship. He specifically referenced the zero-tolerance attitude towards agencies that has become the norm, saying, “One of the things that really concerns me is the ‘happy trigger’ that I see in a lot of clients. At every turn [brands] can’t just be firing the agency thinking that if [they] do that, then things are going to get better." Scotti isn’t the only one to observe this trend. It has been coming down the pipe for a while; we’ve seen it reflected in the mass rush for agency reviews in the past few years, and in the in-housing trend, to give a couple examples. One way or another, clients want out of the old agency-brand relationship dynamic and have demanded more favorable terms. Now, people are talking about the cavalier manner in which clients are quickly dropping agencies and identifying it with the larger “ghosting” phenomenon. Have things gone too far, or is this indifference on the part of clients warranted? Recently, I got an email from the Agency Management Institute which led with the observation that “clients seem to have much shorter fuses when it comes to agencies these days.” Framed as “bad break-ups,” the takeaway was that agencies of all sizes across the country are getting “break-up” emails and calls from clients “with no forewarning, discussions about dissatisfaction, or severance time frame.” Just basically, “FYI, we’re moving on.” While that may be marginally preferable to outright ghosting, it’s a difference of the smallest degree. 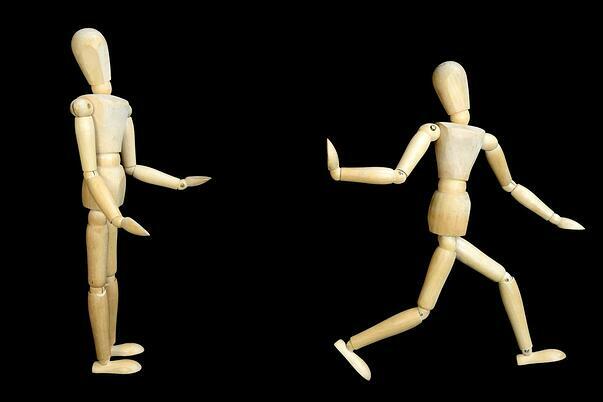 Even the choice to break-up by email or phone rather than in person is an act of avoidance. The bottom line is: there is no room for agency error, no room to discuss salvaging the relationship. The decision has been made; the client is already out the door. At one time, a change to a significant business relationship warranted a certain degree of professional courtesy. An advance warning, a proper explanation, an opportunity to make it right, delivered face-to-face. But today, the message being sent is that the relationship is, in fact, insignificant. Why is this happening to agencies now? What’s behind this phenomenon, and what motivates clients to do it? By considering those questions, we can think about strategies to help prevent it, and what agencies might do to mitigate the potential damage of being ghosted. Trust between agencies and clients seems to be at an all-time low. Identified as a problem since at least 2016 (when the ANA released its pivotal report on media agency transparency), agency-client trust has continued to decline (AdWeek). The damaged trust has undermined relationships and fed into the big industry trends, including consultancies being selected over agencies, brands taking work in-house, and an increase in smaller-scale, shorter life-span work vs. big AOR contracts. For years, industry surveys have revealed a gulf between agency and client perceptions (see, for example, SoDA’s 2016 report on the agency-client relationship). That could — and should — have been fixed through improvements to communication, transparency, and accountability. Without that in place, trust in agencies has continued to take a major hit (AdWeek). Fearful they were being taken advantage of, clients sought to change the dynamic and regain control. And they’ve done so quite effectively. In recent years, agencies have been forced to take on the diminished role of vendor vs. consultant or strategic partner. It shouldn’t be a surprise that where there is a lack of communication, distrust, and weakened relationships between parties, ghosting (and a general lack of caring) would arise. The good news is, where there is a problem, there is also an opportunity. Agency-client relationships are repairable; trust can be regained. But it must be earned. If you sense something is amiss, ask. Don’t wait. Above all, strive to NOT be easily replaceable. By that, I do not mean horde data and control access to important resources. I mean, show clients your agency is irreplaceable through your service, creative, responsiveness, collaboration, and the quality of your relationship. Make it hard for clients NOT to care about your team. Make them doubt they could find another agency that is as enjoyable to work with as yours, or that they could easily match the bottom-line business outcomes your agency gets for them. Ultimately, despite your best efforts, there may be little you can do to stop a flighty client from leaving without warning. You should count on it happening at one point or another. That’s why it's more important than ever to keep your new business outreach constantly going in the background. You want to have a constant stream of leads at various stages in your pipeline so that you aren’t in the position of starting from ground zero while facing the unexpected loss of a major client. Those are desperate conditions, and desperate conditions don’t create optimum new business outcomes. It might take a year or more to connect with, qualify, and nurture a prospect relationship before you are able to close a new account. The best time to invest in agency new business is when you are already doing well, not when you are in dire straits and can’t afford to decline any opportunity that comes your way, even if it’s a dud from a business perspective. That’s a one step forward, two steps back scenario. 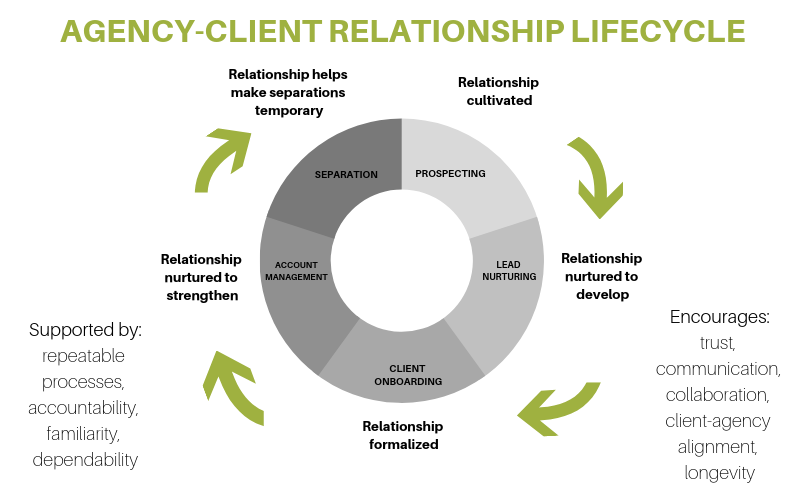 Healthy management of agency business across the client lifecycle supports stronger agency-client relationships. When you are able to reject resource-sucking, low-margin opportunities, you have more to invest in nurturing positive client relationships. Onboarding and client account management — and even client separations — are natural extensions of a healthy new business program. This can be “baked into” your agency’s culture and operations. When you view client relationships across the lifecycle and build them up through repeatable processes that support communication and accountability, it is possible to create an environment more conducive to trust, client-agency alignment, and longevity. In 2017, Sid Lee wrote about the trust problem between agencies and clients, proposing a “4-step action plan to build, monitor, and enhance trust.” One of the things he emphasized (citing his colleague, François Lacoursière), is that “trust must be formally managed by both parties.” The agency-client relationship is absolutely a two-way street. You may have little control over your client’s process, but you can take steps to formalize trust and transparency on your side. Hopefully, by modeling this, you will encourage your client partners to do the same. If you are concerned about your agency being “ghosted” by clients and how that might hurt your agency, consider taking proactive steps now to help address the underlying causes. Think about how you can address trust, transparency, and communication issues in your client relationships to make them stronger and less likely to result in being “ghosted.” And always work to keep future client relationships in the pipeline on an ongoing basis. Image credits: clients ghosting agencies ©Adobe Stock/ pholidito; Agency-Client Relationship Lifecycle © The Duval Partnership.